The Mexican congress scheduled the debate and voting for the laws that will implement huge changes in Mexico's energy sector to coincide with the Football World Cup in Brazil. For many people in Mexico, this was a maneuver from the ruling parties to pass those laws without much attention from the people, distracted as they supposedly would be due to the World Cup. At Flock, we thought there was an interesting tension for many people that are interested in both football and politics. 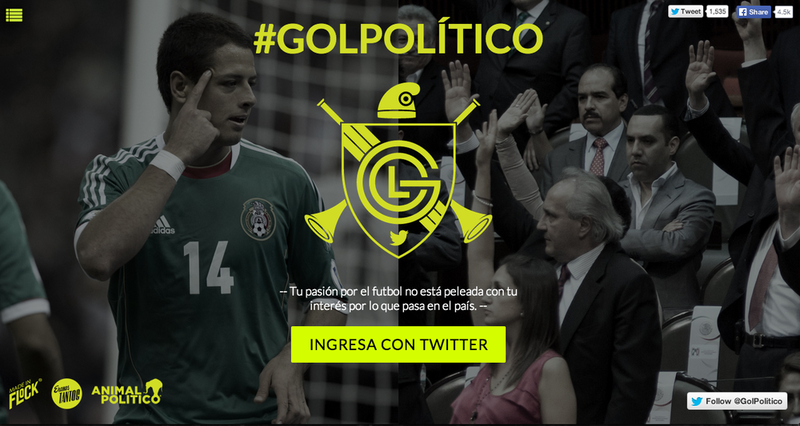 Thus, we made #GolPolitico: a Twitter app that sends a tweet with information about the energy reforms for each tweet that you send about the World Cup. It turns a supposed problem (people's tweets and passion for the World Cup) into an opportunity to disseminate important information. We collaborated with Animal Político (for the content) and Éramos Tantos (design). Coding by Mauricio Ruiz (Twitter app) and Ricardo García (front end). #GolPolitico has been featured in FayerWayer, Pijama Surf and Yorokobu (Spain). Awards: Sol de Bronce, Digital, El Sol 2015, Festival Iberoamericano de Comunicación Publicitaria, Spain.